Everyone should give Rock 'n' Roll Nashville at least one shot. We all know at least one person who has finished the race and it's one of the few times you can run through the streets of Nashville without having to dodge cars. Yes, it has hills but so does life. My favorite part of the St. Jude Rock 'n' Roll Nashville Marathon is the twenty six mile sign. Every time I see that sign, I reflect upon all of the mental and physical work, battles and sacrifices I had to make to get there. There's no easy road to get there and when you do, it's cause for celebration. The more I run this race, the more I enjoy the Metrocenter part of the course. At this point, you're about halfway through the marathon and are sandwiched between areas with excellent crowd support. While the Metrocenter area has a lonely feel, I enjoy it becomes it's a time to zone out a bit, collect your thoughts and get ready for the hills to come. I have a love-hate relationship with Shelby Bottoms. You're over 20 miles into the race, so the end is near. But in the marathon, the real race begins after 20 miles. So I view Shelby Bottoms as the final test before the long drive home. If you can maintain your focus and stay focused on the hills, all of the harder parts are literally behind you. Get a properly fitted pair of running shoes that are broken-in before the day of the race. Running for several hours non-stop puts a lot of stress on your body and especially your feet. You can't train if you're injured, so I make sure to get my shoes at Fleet Feet Nashville! Just like individuals have their own unique traits, the way you body responds to the running motion will be unique as well. Some people may need a shoe with a lot of support, while others feel best in a lightweight, more neutral shoe. The best way to find out what is ideal for your body is to see my friends at Fleet Feet Nashville. Embrace the process. Running a marathon isn't easy and neither is the training you put in to get you ready for it. Understand that a great marathon race day experience is the result of a lot of good training days, a lot of ok training days and sometimes even a lot of bad training days. So take things one training run at a time and when the training day is over, leave it behind you when it's time for the next one. While nothing is more satisfying than slaying a really tough workout, understand that struggle and failure equals growth as well. Train for the distance AND the conditions you'll be facing on the course. People often train just to complete the race distance without also catering their training to the course and conditions they're going to race on. While you can put in a lot of track work when training for a flat marathon course, such as Chicago, you need to run over a lot of hills to prepare for Nashville. Practice race day things in training. You can go into a marathon with perfect training but if you aren't prepared with everything besides your running fitness, you may find yourself struggling on race day. How much liquid can your stomach handle while running? Are you going to use liquid carbohydrates on the run or something more foodlike, such as gel bites or actual food? Find what works best for you. Find a group of motivated runners to train with. Training is easier and more fun in a group and you'll be running in a big group on race day. It's also a great way to make new friends, learn from others and keep yourself accountable. Fleet Feet Nashville offers several different training programs from "couch to 5k" to full marathon. I really don't have any pre-race rituals other than using the days leading into the event as an excuse to eat plenty of sugar, in the name of carb-loading. For the most part, I view races as an extension of training and take confidence in the work I put in. I take what I've learned from the build-up and do my best to execute it in the race. 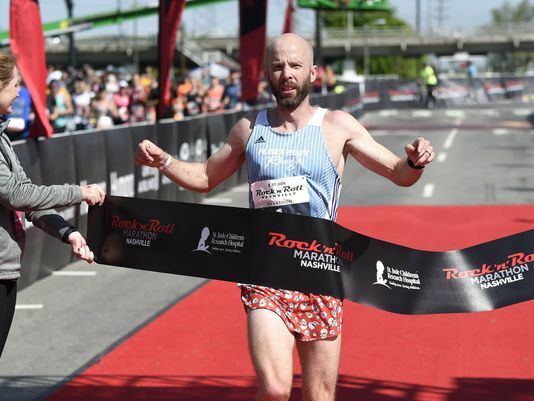 - Scott Wietecha, six time St. Jude Rock 'n' Roll Nashville Marathon winner.